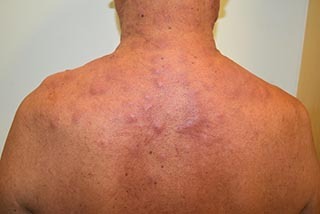 This patient presented with multiple nodules on the neck and upper chest. It started about 2 months ago when he had persistent cough with little sputum. Subsequently he noticed a nodule on the left upper chest which progressively spread to the neck and contralateral side of the chest. He had associated fever and weight loss of about 4 kg. 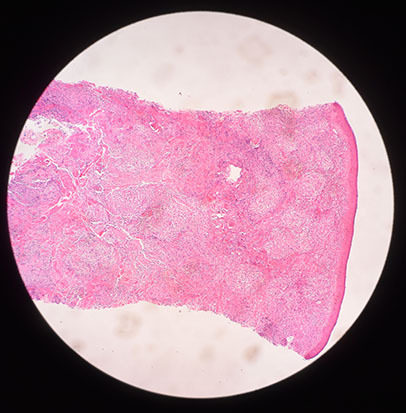 epidermis is unremarkable. PAS and ZN stain for organisms were negative. Immunohistochemistry studies: the tumor cells are positive for CD4 and CD3. The tumor cells were immunonegative for CD8, CD20, and CD30. 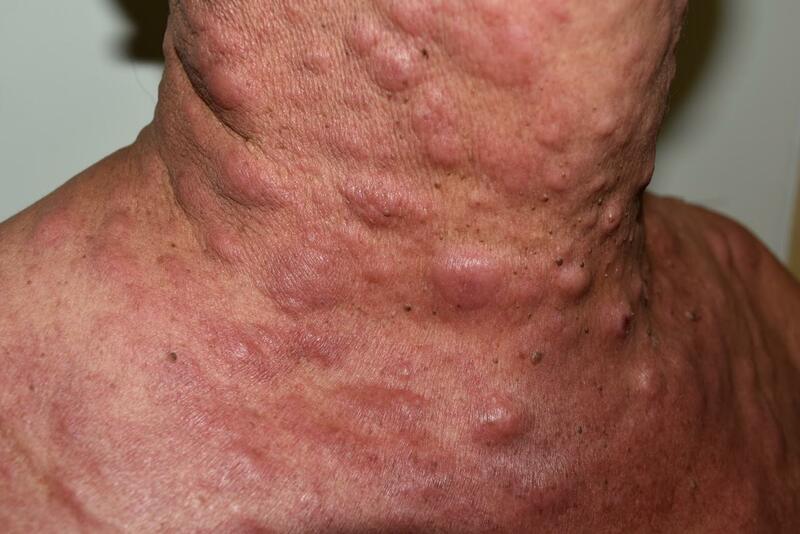 He had developed fever, more nodules and some of the nodules had an ulcerating centre. The neoplasm had appeared more aggressive within a week of workup. 2. What further immmunohistochemistry stains should be done? 3. What is his treatment and prognosis? 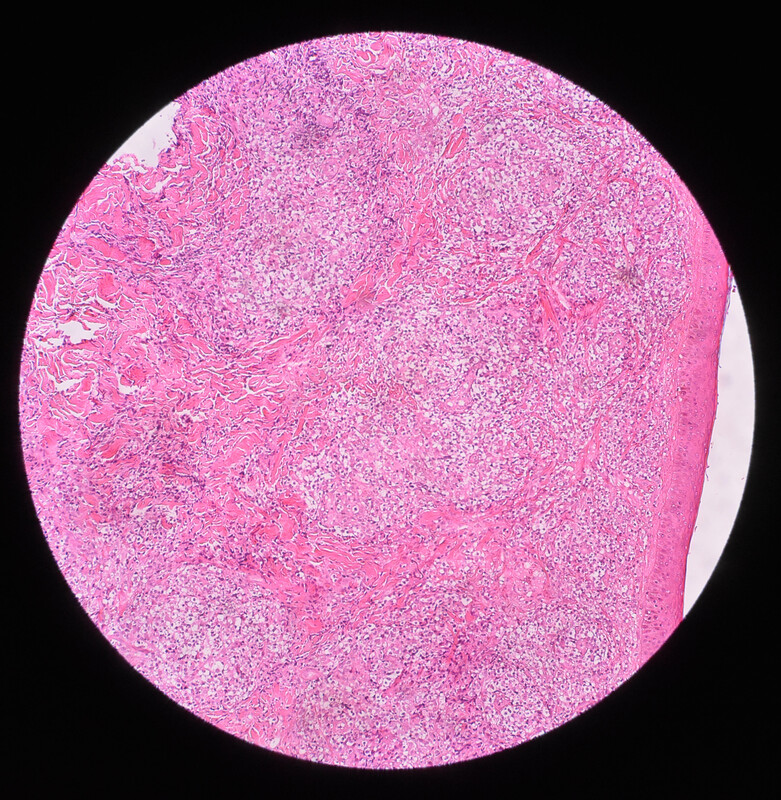 Andrese E. Blastic plasmacytoid dendritic cell neoplasm - An evolving entity and case report. Rev Med Chir Soc Med Nat Iasi. 2015 Apr-Jun;119(2):379-83. Xia Y, Yang Z, Chen S, Huang C, Tu Y, Tao J. Extranodal NK/T-cell Lymphoma Mimicking Erythema Multiforme. Indian J Dermatol. 2015 May-Jun;60(3):322. doi: 10.4103/0019-5154.156454. Nice case with good photos. I'd contact Dr. Alain Rook of the CTCL unit at Penn for his recommendations. My bet is he'll recommend several aggressive systemic therapies, including IV romidepsin. Topicals and phototherapy probably would be a waste of time. The patient will probably be going into 'tumor d'emblee'. Will need total electron beam. Guarde prognosis. This is quite a case. CD3 positivity suggests T-cell lineage and essentially excludes BPDN (blastic plasmacytoid dendritic cell neoplasm) which tends to be CD4+56+123+TCL1+. The CD4 co-expression makes NK/T (NK T-cell lymphoma) less likely. I think we are left with some sort of aggressive peripheral T-cell lymphoma such as AITL (angioimmunoblastic T-cell lymphoma) or PTCL unspecified (peripheral T-cell lymphoma] (as you know, what used to be called d'emblee MF (mycosis fungoides) when such lesions presented in skin only), or less likely, leukemia cutis (T-ALL) (T-cell acute lymphoblastic leukemia) in the setting of a relatively normal complete blood count. He was warded in a General Hospital for 5 days after which he was transferred to another GH. He passed away 4 days later. He deteriorated very rapidly and within 3 days of admission at the General Hospital, he was ventilated. Thereafter his condition never improved.